At the end of April 2016, the brothers extended an invitation to young people to come and join Br. 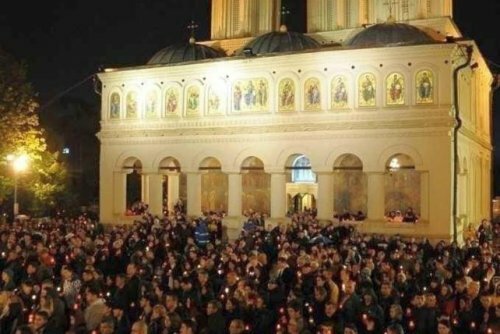 Alois in making a pilgrimage to Bucharest to celebrate Holy Week and Easter in the Orthodox parishes and to meet with other Christians living there. This latest stage in the Pilgrimage of Trust is the fruit of a long relationship between Taizé and the Church in Romania going back over many years. Already in the 1960s, Romanian church leaders were able to visit the community and during the 1970s and 80s, brothers of the community and young volunteers made discrete visits to the country meeting with the Christians, making visits to the monasteries and to church leaders from the Romanian Orthodox and other churches. These simple signs of solidarity were important for a people who were not able to travel abroad and were often obstructed in the practice of their faith. In January 1990, immediately following the fall of the dictator Nicolae Ceaușescu and the opening of the border, Brother Roger travelled to Bucharest. 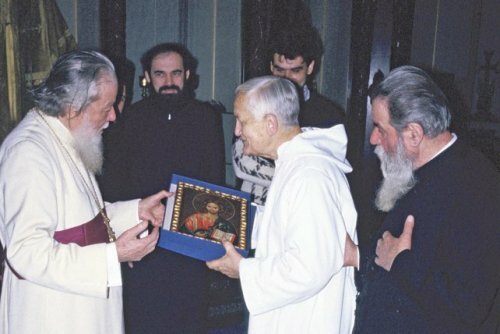 While there he met with Patriarch Teoctist as well as Father Constantin Galeriu and Father Dumitru Stăniloae, two well known theologians and important symbols of the continuing light of the Christian Church during the communist regime. After this many thousands of young people from Romania were able to come to Taizé during the summer months and to the European Meetings. Brother Alois has also, more recently, visited Romania several times, and been warmly received by church leaders and the faithful alike. In the past few years young people have joined brothers from Taizé on pilgrimage, to discover the richness of Orthodox worship and spirituality, often forged over the centuries in times of great trial, but where faith in the Resurrection of Christ has helped so many believers to hold firm. 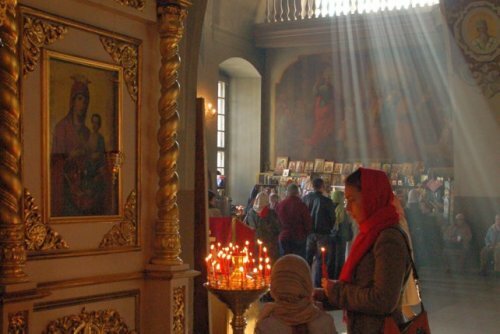 Pilgrimages have taken place to Istanbul in 2013, celebrating Epiphany with the Patriarch of Constantinople and the other Christians of the city; to Moscow, taking part in the Holy Week and Easter services in 2011; and to Moscow, Minsk, Kiev and Lviv during Easter 2015. “Having met Brother Roger on more than one occasion, I noticed each time how much he knew and understood the tradition of the early Church, and how the Word of God and the writings of the Church Fathers were a basis for his personal spiritual experience. Combining fidelity to the teaching of the Holy Fathers with creative adaptation to the needs of today, in a missionary ministry among youth, characterized the path of Brother Roger and that of the community founded by him. In 2016, this journey will continue with a pilgrimage to Bucharest from Wednesday 27 April to Monday 2 May, to celebrate Holy Week (the Great Week) and Easter. With the blessing of His Beatitude Patriarch Daniel, Brother Alois and other brothers of the community will travel to Romania, accompanied by a group of young people from all over Europe and beyond. It will be an opportunity both to discover the vitality of today’s Orthodox parishes and to talk about the challenges facing these communities in modern Romanian and European society. In this way we hope to enrich and support each other as we seek to bear witness to the Gospel.